Since 1947, Foodservice Equipment that Delivers! For over sixty years, Carter-Hoffmann has been helping people enjoy fresh and appetizing meals. From banquet guests to quick-serve restaurant diners, grade school students to hospital patients, they make it possible for you to serve every meal as fresh as when it was prepared, no matter if you’re serving one or 5000. From their beginning in 1947 as a small welding shop specializing in stainless steel fabrication, Carter-Hoffmann has grown into a leading supplier of commercial foodservice equipment with products for holding, transporting, rethermalizing, and serving. Today, the world’s leading hotels, resorts, chain restaurants, and institutions rely on Carter-Hoffmann equipment to deliver their meals efficiently, safely, and kitchen-fresh. From keeping hot food fresher longer to capitalizing on impulse sales with front of the house holding and merchandising equipment – you’ll find a complete set of categories to choose from here. A complete line up including beverage and cold plate dispensers, french fry, plate and dish, cups and lids, silverware dispensers and more. For over 30 years, Sammons Equipment has been providing the most reliable and innovative standard and custom made products in the Food Service Industry. Headquartered in Corona, California, their clients include the world’s most prestigious hotels and resorts as wells as schools, hospitals, restaurants, convention centers and correctional facilities. Sammons Equipment’s unmatched commitment to excellence has lead to a consistent record of satisfied customers. Whether you are looking for a custom-made product or are ordering straight from their catalog, Sammons Equipment’s affordable prices, unsurpassed quality and world-class customer service keep their clients coming back for more. Ordering from Sammons Equipment means that you are ordering a top quality product superior in design, construction and appeal. Although the industry and the business climate have changed, Sammons Equipment’s dedication to quality remains constant. They have done this by creating a culture which makes every effort to surpass customer expectations. Who can resist the sight and smell of fresh, hot, ready-to-serve food? NEMCO merchandising equipment puts your great-tasting temptations front and center for attractive presentations that also preserve freshness and flavor. Brightly lit interiors plus attractive, large, glass fronts and sides draw attention and fully showcase food selections. 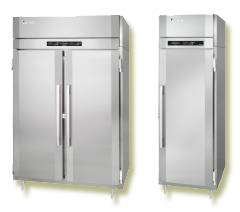 Thermostatic controls and humidty pans on several models let you manage freshness and overall food quality. Adjustable shelving plus accessory racks and other options let you customize your merchandiser for a wide variety of food items. Promotional signs available for most models. Brushed stainless steel and tempered glass require little maintenance, and are easy to clean. Durable, hard-working construction lasts and lasts.